It is nearly whale-watching season on the Golfo Dulce, Costa Rica! Playa Nicuesa Rainforest Lodge is readying to receive visitors to witness one of the most amazing spectacles in the animal kingdom â€" the thousands-of-miles-long migration of Pacific Humpback Whales. Starting in August, the tranquil blue waters of the Golfo Dulce, between the Piedras Blancas National Park and the Osa Peninsula in southern Costa Rica, begin to receive the endangered whales that come annually to breed and give birth in Costa Ricaâ€™s warm waters. The annual migration of Pacific Humpback Whales is a remarkable journey of nearly 10,000 miles from near the North and South Poles to warm tropical waters. As winter turns the seas to ice in Antarctica, southern Humpback Whales swim north to the Great Barrier Reef of Australia and as far as Costa Rica, where they can be seen between August and October. Northern Humpbacks travel from Alaska and British Columbia south to warmer waters by Mexico, Hawaii and Central America from December to March. 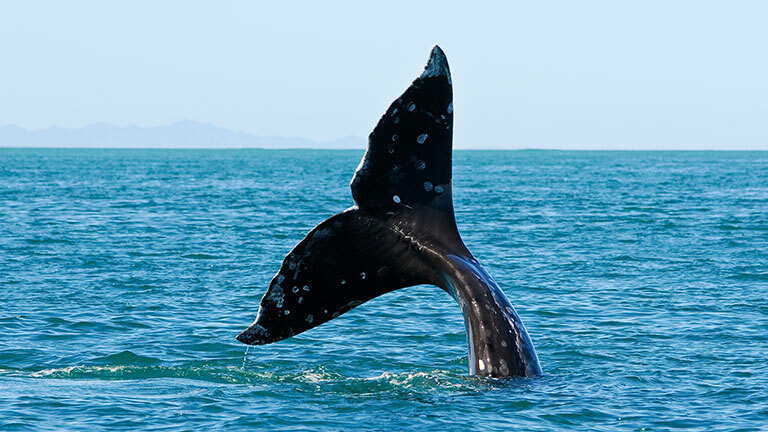 You can see Humpback Whales in Costa Rica along the southern Pacific Coast, from the Ballena National Marine Park just south of Dominical down through Cano Island Biological Reserve off of Drake Bay and into the Golfo Dulce. Known as a tropical fjord, the â€œinner seaâ€ of Golfo Dulce is a critical habitat for Humpback Whales and is vital to the speciesâ€™ survival, according to the Center for Cetacean Research of Costa Rica (CEIC). "A large part of the Gulf is used by Humpbacks to rest, give birth to their young and nurse them," notes the CEIC. "The importance of protecting this area becomes more urgent if we take into consideration that Costa Ricaâ€™s economy depends on tourism .... Today, many tourists come to marvel at the solitude of these sanctuary waters; for them to see a dolphin or whale swimming near their boat is the best living evidence of the well-being of this still wild place." Once hunted to near-extinction, Humpback Whales are an endangered species with international government-protected status. Humpback whales are named for the prominent hump on their backs. The baleen whales can grow to be 56 feet long and weigh up to 40 tons, with distinctive, long black and white pectoral fins (flippers) that reach about one-third of their body length. They live a long life to about 45-50 years old. Babies (or â€œcalvesâ€) are born after an 11-12 month gestation period, which explains why some years when the whales are visiting tropical waters they are breeding and other years they are giving birth. Humpback whales are easy to spot since they live at the oceanâ€™s surface, both in the open ocean and in shallow coastline waters. They swim slowly and are known as the â€œacrobats of the seaâ€ for their great displays of jumps and splashes (breaching). Males are famous for singing long, complex mating â€œsongsâ€ â€" sequences of squeaks, grunts, and other sounds â€" during their migration and when in breeding areas. In the Golfo Dulce, the migrating whales are almost strictly from the Southern Hemisphere. Males concentrate at the entrance to the Gulf waiting to breed with available females, while pregnant females swim into the shallow waters of the Gulfâ€™s interior to birth their young and breastfeed them. See these gentle giants in person on the Golfo Dulce in Costa Rica. Playa Nicuesa Rainforest Lodge is located in the pristine rainforest on a remote beach of the Golfo Dulce. During whale-watching season, the award-winning Costa Rica eco-lodge offers boat tours of the Gulf to see the whales, resident pods of dolphins, and other marine life like sea turtles and seabirds. A TripAdvisor Certificate of Excellence winner, the rainforest lodge in Costa Rica has its own 165-acre private preserve bordering the Piedras Blancas National Park. It is a unique adventure travel destination for its remote, pristine wilderness location.